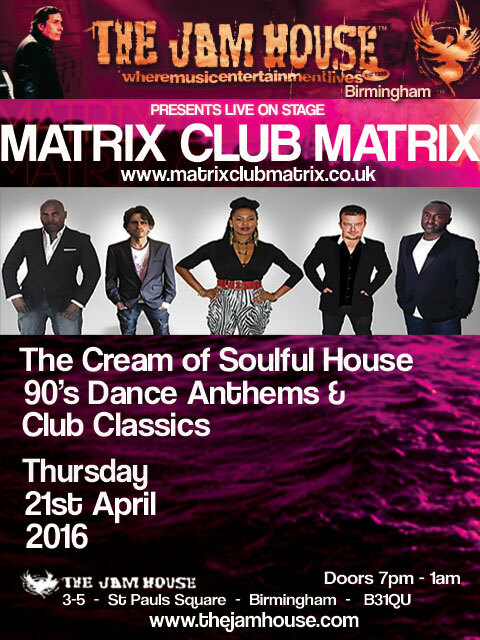 Matrix Club Matrix return to Jools Holland’s stunning live music venue, The Jam House, Birmingham. By selecting the cream of Dance anthems, 90’s House and Club Classics, they have captured the energy and vibe from the names that shaped the world of dance music and perform them completely live. Prepare to hear them performing stunning live versions from artists such as Jocylin Brown, Candi Staton, Robin S, K-Klass, Living Joy, Barbara Tucker, Faithless, Bizarre Inc, Groove Armada, Ce Ce Peniston, ….. and so many more. Matrix Club Matrix are an uplifting, tribute to Dance music…. Designed to keep you there on the dance floor.